Digital streaming technologies -- either via a standalone device or a smart television set -- are now present in about a third of U.S. TV homes and are beginning to have a pronounced effect on the way people watch the medium. Those are the findings of a “Device Acquisition Study” conducted by Nielsen this summer and presented to clients during its recent national client meetings in New York and Los Angeles. 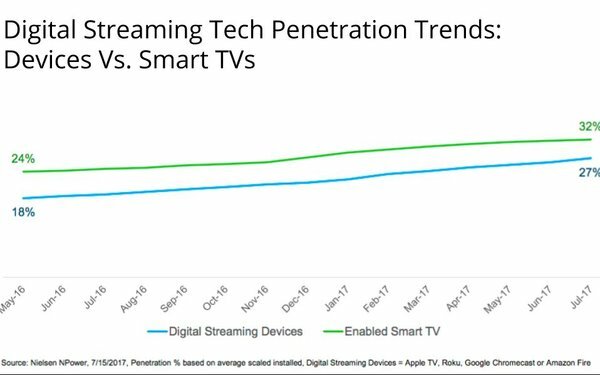 The study estimates that enabled smart TVs have penetrated 32% households, while streaming devices -- such as Roku, Google Chromecast, Apple TV and Amazon Fire -- are now in 27%. The study finds that penetration figures are significantly higher in younger households. 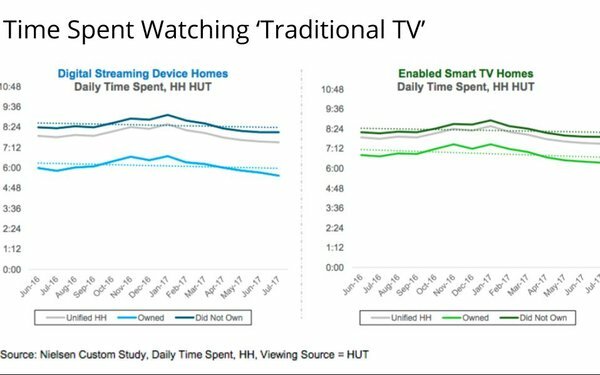 Most significantly, Nielsen found that the presence of digital streaming technology dramatically impacts viewing patterns and that households equipped with such technology watch appreciably less “traditional TV” than homes that do not (see charts below). Nielsen described these studies as “longitudinal” and noted that the erosion of traditional TV viewing appears to increase over time in households adopting digital streaming technologies. 1 comment about "Streaming Tech Reaches Third Of Universe, Eroding 'Traditional TV' Viewing". Ed Papazian from Media Dynamics Inc, November 8, 2017 at 2:46 p.m.
Not surprising findings, really. Of course homes that have streaming capabilities and content to watch begin to spend less time with "linear TV". What's important to bear in mind is that the residents in such homes----streaming households---still appear to devote considerably more time to "linear content"---especially sports, news, and many other genres not customarily available via streaming sources to any significant extent. They also appear to be fairly big basic cable viewers, though not necessarily so for broadcast TV entertainment features.